This app used to work, but it doesn’t even get past the splash screen anymore. Cancelling my subscription. Try copying a url to an article to LinkedIn or to google docs. If you click the share icon, then copy, then past that into either Linkedin or google docs the only thing that pastes is a picture. No problem, just open the article in a browser and do it that way... except “open in browser” isn’t supported by the app. Hmm maybe if I send it as a text messages and get the url that way. Finally! Talk about a poorly designed app. I’ve been an annual subscriber to the chronicle for years. Today I opened the app and my screen was taken over for an auto-play video ad for RocketMortgage Rate Shield. This is intrusive, user hostile, and obnoxious. Is this what paying subscribers have to look forward to? Reading the Chron via app, one would think that all that Bay Area people are interested in is Bay Area sports and the wine country, with a smattering of news. Since I don't see the paper version of the Chron, I don't know what's buried, but the app highlights these topics and buries actual news stories. And it highlights the same content for days -- weeks -- on end. Navigation is better. Load times are much faster. I still enjoy my coffee and Chron with breakfast, but the on-line version fills in nicely as a reliable source of local, regional, national and international news when I don’t have access to a physical newspaper. Version 2.3.8 - still crashes daily. If you are listening to music while reading your paper, it will repeatedly stop your music from playing. Navigation with the swipe left and right makes scrolling through an article challenging. Still wish for a larger font. Version 2.2.5 - really pretty much the same. I have written to the support team and they say they are working in it. But this app has really not improved much in the past year. Layout and image placement has improved. But load times and crashes have not. And the app is often unresponsive when you return to it from another app. This app is still inconsistent and crashes daily. While there is some control over font size - still too small for my eyes. The layout is inconsistent and images sometimes do not show up. It seems their support team is as frustrated with their developers as the users are. I truly want to support the chronicle with my subscription but the app really has to work better. Previous - This is how I get my Chronicle every day. The articles are all there and they have fixed many interface issues. But they also introduced a new one - if you get an error due to spotty Internet coverage, the only recourse is to relaunch the app, even when there is Internet access. 1. Slow and annoying reloads when switching apps. If you leave the app and come back, you will get back to where you left off, but only after a tedious reload. FIXED 2. Also slow to switch between articles and even turn pages. The page turn slides the entire interface across the screen just to get to the next page. Most apps I used for reading are much faster than this one. IMPROVED 3. Part of the reason I read the paper digitally is to be able to follow links in articles. Most links are just listed as text so you cannot click on them. Nor can you even copy the text to put in a browser. Major flaw! IMPROVED 4. Seems to take forever to download a new edition (on very fast wifi). Often get message to quit the app as new edition has just been downloaded - annoying. And don't even try to download to read offline. Takes forever. FIXED - but they still have a poor updating process. The chronicle has great content, but this app takes forever to load it... I usually give up after waiting several minutes watching the spinner while my phone tries to open the app. The app is great —- supplying articles that are very informative, well-written & timely. Ever since the last update I have not been able to open up the newspaper ap. Can someone help me? Since introduction of latest update a few days ago, application will not open. Hangs on splash screen. Come on Chronicle, you can do better than this...well, you certainly can't do worse. App is buggy as all get out on the ipad. Have to start and restart multiple times to get it to function at all. Been this way for a long time and they have demonstrated no ability to fix the problems. I like the layout and when the app mostly works I tend to find articles I miss in the print version. I have a current model & software iPad Pro. I was hoping the bugs causing the app to hang on some sections and articles would be fixed with this release but instead it hangs on start. Hope the next try goes better. I have to start it 4or 5 times before it will load. It often quits. Now it's asking me to subscribe again. If it's not fixed soon, I'll cancel my subscription. 7/7/18. It was working quite well. Then they “fixed” it. The latest version will not open. Can no longer open the app! It was getting better for a while, but since this last update I can’t even open the app! The new version hangs immediately upon opening it. No news, no sections, just a title screen and infinite load. Where is the quality control? Why no zoom on photos??? I love the app. And I love the photos by the very talented Chronicle photographers. But, why can’t we be able to zoom in and out on the photos? Seems like an easy thing to program. Please include the zoom function in an upcoming update. Thanks! I pay for a subscription which I can seldom read. The app has never been very reliable, but today I did the “bug fix” update and now it won’t even open. Just gives the skinny thing for a bit and then crashes. When I started using the app almost 2 years ago, it was an embarrassment. Constant crashing, a refusal to update...almost unusable. While the layout isn’t the most beautiful to look at (the NYT and Wash Post are much nicer), the app just works. Kudos for taking on this previous disaster and fixing it. I’m a long time Bay Area native. I’ve read the Chronicle for a long time and it’s quality is the best it’s been since the Herb Caen days. There are so many good writers: Ann Killion, Tom Stienstra, Bruce Jenkins etc. The app makes it easy to find all these great writers. Have not been able to get on the app since the update. Not the first time this has happened! Tired of the problems!! Maybe it’s time to cancel!! The app has not opened on my phone for about a week. It just spins. Don’t like paying for an app that is unusable. Will cancel in a few days it it doesn’t start working. I can’t load this app since the last update, it just spins its little wheel. The app is slower than my other news apps. Besides this minor inconvenience, I enjoy the convenience . Low quality. Slow, ugly, rarely works. Even after upgrading to version 2.1.3 it is slow, articles do not load, hangs. Same iPad runs NYTimes app without a glitch, so it is not my device capabilities, since a similar app can be written well. Very frustrating and embarrassing for a SF newspaper. Update for 2.3.7: the new update caused app to close when opened, so once I uninstalled and reinstalled, the app works. Once it is working, it has gotten better than a few years ago. After updating a few days ago, the app doesn’t work. When I tap the icon, the IPad tries to load the app, but it fails and exits back to the main screen. Latest version is not opening on iPhone 6 with current iOS. I can almost never get this app to function. It’s a serious embarrassment that the Chronicle can seem to find anyone in this town to create a workable app. Navigation and search are still clunky. And things on top stories either repeat or don’t show up. But it’s usable and beats having my chronicle stolen off the doorstep every morning! The main complaint I now have is that when clicking through from a link in the morning or breaking news emails, it doesn’t recognize me as a subscriber and then shuts me out (or continues to ask me to sign in over and over and then never takes. At least it could offer to open that link in the ap. To be fair, it took the NYT a long time to program this functionality! Do not use on iPhone or iPad!!! I just spent an hour trying to access this app on my iPad. I turned off iPad, reinstalled the app and still couldn’t get logged in. I called Chronicle support. They told me I had to activate my account again, which I did and got prompted, “already activated”. Then reset my password, again. Tried logging into the app again and it still won’t work. THEN she tells me just log into the website Bd the app doesn’t work, on iPhone or iPads!! WHAT!?! Although I deleted and re-downloaded the app, I continually experience pages freezing. This has yet to be taken care of. The app is easy to navigate, but often it takes seemingly forever to download content, even with a good connection. I don’t have this issue with similar apps (e.g., The NY Times) so I think this is an issue the developers should be able to address. This app works great for me. I highly recommend it. Why oh why can’t I log in to use the app with my credentials from the website?? I have to create a separate “app login” and to do that, I need my account number. Which means trying to hunt it down somewhere on the website, and copying it over on the tiny keyboard and for what, so I can have to remember TWO sets of credentials rather than one?? As a software engineer, I can tell you there is NO reason for this. This is the hometown paper in the tech hub of the universe. Get it together, guys! I’m still getting freezing problems going from page to page. Five stars....fabulous! The app works great on my IPad .. It travels with me every where and is readable every where with or without Internet service. This is the worst, the Worst, of several newspaper apps I use (with full paid subscriptions to all). How in the world does the home town newspaper of tech central have such a difficult to use app. It took way too many steps to register for a paid subscription online...and THEN it took a number of additional steps to establish a required separate login for the app—something that is not required by the LA Times, The NY Times or the Washington Post. I’ve had to phone customer support several times, and the are very friendly but not very helpful...it feels like it’s outsourced, and the have to put me on hold EACH time I ask a question. Local newspapers may be suffering a decline in readership, but the SF Chronicle seems to need to add self-inflicted wounds. The app no longer works if your location is outside of the US. Apparently it does no comply with the new international privacy laws. The app is now useless if you are living or traveling abroad (previously a key benefit) and now domestically you must wonder what they are doing that violates international privacy standards. Wanhhhh! My app is broken. Won’t update anymore. I tried deleting and reinstalling but no joy. The worst app on my iPhone. Extremely slow loading, and almost every use ends in the screen freezing. Slightly better than a couple of years ago, but still horrible. I now read all newspapers online. The convenience compensates for whatever I miss in the newsprint version. The Chronicle app has improved some over the past year or so, but it still crashes about once a week, so I have to reload. There are some glitches that just won’t go away. One example: recently there was a cool story about the most fun restaurants in SF. Try as I might, every time I clicked on the story, the app would freeze. After four or five attempts, each beginning with deleting the app and then going through reloading it continued. I finally gave up. Guess I’ll never know the most fun restaurants :) I also read the NYT, WSJ and once a week the London Times. I never have the issues with those apps that I do with the Chronicle. But I still want to read the Chron, so it’s like walking around with a rock in my shoe. Irritating, but I still do it. Please keep trying to make it better. It is so nice to have the paper on my phone without a bunch of intrusive advertising! Moves smoothly and I can find and read whatever I want. Seems to have solved the too-long-to-load problem. Thanks! It’s glitchy and extremely slow. Crashes frequently. As a subscriber to the newspaper I’m disappointed that the Chron expects me to use this app to read articles. It has developed glitches. Freezes. And the search function is spotty. Takes several guesses to find the article I know is there. Editorials don’t always have authors and are difficult to locate. Still a good app, but a few tweaks could get it back to fab. The app finally works better. Updates are good. The remaining issue is incomplete loading. The section, setting header does not always appear and sometimes the articles are clipped with titles and part of the article missing. The app works well, does not crash too often. No real complaints. The app is poorly organized and has poor navigation. In the latest version I can’t even find the comics. Scrolling through multiple articles is not efficient navigation. Much improved over earlier versions— it doesn’t crash, organization of menus is clear. Yes, it doesn’t have the copy of the print edition front page, but many more photos and graphics are available than in print. After a painful, rocky beginning this app is doing what it's designed to do: deliver the paper. It now launches quickly and selected articles open almost immediately. My congrats to the tech crew for getting this worked out. Sorry that your bosses gave it the public before it was ready. So far, the app has ignored my request to load on my ipad, iphone, ignored request to change/re-new credit card info, and after a week of back and forth (and not the first time, a quarterly event actually) it still does not work. I much prefer the replica format, where I can see the page. I don’t like the separate articles listed in a bullet point format, Correct me, please, if I’m simply not using this app correctly. Some tech company needs to disrupt this paper. Hire their staff and build a modern app that’s fit for this city. Try copy pasting an article url into google docs. You can’t. All you get is a picture from the article. It takes forever to load and when it comes up it displays an old screen, even though the time and date are correct. It usually takes shutting down the app and restarting it more than twice to get it to load the current items. And then....it often freezes and needs to be restarted.....again. There are many well designed newspaper apps out there. Why not just license one? I dislike having to create a separate login as a subscriber. I also find it difficult to go back to previous articles I read, especially those that came through the notifications. They often cannot be found on the front page, whether it be breaking news or traffic alert. However, I enjoy having access to local news and knowing what’s happening in the local community. I used to have extended gang times for pages to load. It rarely happens now. I would like to see easier navigation between top stories such as Washington Post has. The App has improved greatly, and is now a pleasure to use. Still some technical glitches occasionally slow down the app, but mostly, it gets out of the way and lets you get to the news you need. The app works just fine, it’s easy to navigate from article to article, although the sections have many crossover stories which I find annoying and distracting. The Chronicle itself is an embarrassment for a major metropolitan city’s voice. It’s political stance aside, I find the content to be repetitive, dated, incipient, and incomplete. Unfortunately this is the only daily this area has, so this is what I’m stuck with. I look at the chronicle as a small town rag keeping the folks updated on what Aunt Tilly told Ole Jacob over the back fence. Now that I think about it, that might be a huge improvement. Slowest of any of my news apps. Takes forever to load, hangs up frequently and shuts down for no particular reason. In short, infuriating! The stars are only because of the content. App is zero stars. Truly awful. Can one get zero stars. Can't figure out how to read offline or remove all the space it takes up. Navigation is illogical. I can't even find a search function. Why not copy the NY Times. This should be an embarrassment. The App stinks when compared to the online version. Dated look, with no commentary function. No Wonder the App Developers have made it nearly impossible to stay logged in to the online version. SHADY. Much faster loading and navigation. Only annoyance is scrolling - or lack thereof: page wants to "jump" to next screen which is smaller than my device's so I have to "hold" it in place to read first couple lines. Otherwise, much more usable app. Love it! A taste of the SF Bay Area! Great app for getting the news. Others here have mentioned weird refresh issues and I have noticed slow performance at times. Giving this app 4 stars. Will give it 5 when these are addressed. The performance of the latest version is great. I previously had problems with slow content load times. Technical support had me delete and reinstall the App and it fixed the problem. Subsequent updates have improved the performance even more. I’m very happy with the performance, content and responsiveness of the technical support team. You know you’ve hit the end of the new articles not when the list ends, but when you hit the articles that somehow stay on the front page FOR YEARS: “saving stephen hawkings voice”, “many China’s, many tables”, “the ultimate NorCal brewery map”, “neighborhood rises in the shadow of Salesforce tower” and “michael Bauer’s top 100 restaurants”. Try using the copy to clipboard function and pasting it into a google doc. You won’t get a URL that’s for sure. Try reading an article... you can’t, ads cover the text and so do picture descriptions. Want articles to be on the front page for YEARS? You’re in luck with this app. I pay $100+ a year for this? The initial version downloaded was awful, but I stuck it out for a few months and there were several updates during that time. The app mostly works now. I have been an off/on subscriber to the Comical for 25 years. Unfortunately their system is confusing my old expired subscription accounts with my current active one. The result is the app will not let me logging with my account. So I can’t read the paper I’m paying for. Constantly fails. Freezes. Won’t scroll. Not worth the time. Honestly, how hard can it be? Get a grip SFChron. Too bad, so much to say... Update: after following the Chronicle’s suggestion of deleting and reinstalling the SF Chronicle’s app, all works well and as expected...thanks! When I share an article, I want the ability to just copy a url. Don’t give me a “I thought you might be interested” text and don’t give me a picture. Every single time I have to go and remove that. Update Current version is working well. App tends to crash. Articles are slow to load even though the issue has been downloaded. Easy to navigate through the paper. I've being using this since it was first available. Ive used on the original iPad up the current version. Very disappointing that they have not done much to improve the performance. The current version is not usable. Difficult to load new days, has always been an issue, and frequently freezes, newer issue. I am a long time reader. The app is getting worse rather than better. Try emulating the Sacramento Bee app. It works every time. Whatever you did it is fixed. It loads quickly, doesn’t crash and it is easy to navigate. I wish only for more in-depth articles. Chronicle, please start over and try again! Words cannot describe how poorly this ap works. Constant freezes essentially make reading the Chronicle impossible. I have been trying to read just one section and have wasted 30 minutes. When will the Chronicle address the problem? Deleted the App & reinstalled as directed. Much improved, thank you! Able to enjoy rage Chronicle again. I’m actually surprised this app is allowed in the Apple App Store. It consistently crashes and freezes, and it almost feels like it is getting worst over the past few months. 2/23/18 The current version of the app is much more stable. I lile the idea of using this app to read the Chronicle. However whenever I give it a try, it freezes up. I reluctantly go back to reading the web based Chronicle. This poor performance has been going on for several years now. Come on guys. Get it right! It takes about 7 minutes to get this app running and view the news stories. Crashes often and buggy as hell. Updated: Deleting app and downloading/installing new version solved all my problems. Rating is now 4 stars instead of 1. I want to update and revise an old negative review I wrote. It’s only fair. 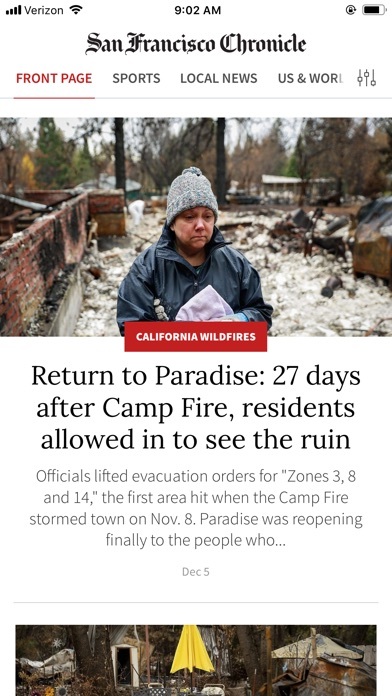 The folks at the Chronicle have done a lot of work and the app works just fine. I’m glad to have a good source of local news that is easy to use. Old review: I want to read a local newspaper, but the SF Chronicle seems incapable of letting me do that. The site just doesn't work. Pages don't load, stories don't open, the site crashes. Seriously, I am only able to read all three sections I like to read about once a week. This is seriously embarrassing for a newspaper in the capital of the world's tech boom. Get your act together guys! This site stinks. Once I deleted the app and reinstalled the app, things have been smooth, for my Air2.. The chronicle is a good paper that has been better. Grammar is declining, proof reading seems to be non-existent and outdated articles seem to hang around. The upside is through Bay Area coverage and active investigative journalism. The newer generation of editors need a few more years to fill the shoes of the recently retired staff (Johnson , Nevis) The app seems to be stable after many years of abysmal performance. One would think that a newspaper located in the heart of this country's tech world could build an app that works. Version after version, the Chronicle fails to do so. Articles repeatedly fail to load. The "Front Page" doesn't load. This app is not ready for prime time. The Hearst Corporation should be ashamed. Based on the above review, I received developer feedback to reinstall the app. This seemed to do the trick. My main complaint now is that all of the articles in the print edition don’t always show up in the app. You can read my original rating below. The current version of the app works well, and has good functionality. Compared to the earlier versions it’s much, much better. In some ways I like it better than The NY Times app, which seems to have been driven towards mediocrity by over ambition and advertising screen real estate. It has been a long haul for the chronicle hopefully the recent progress continues. My original assessment continues: The overall reading format is still clunky, but the apps reliability and usefulness has improved, ie. it doesn't crash as much. The NY Times continues to perform consistently better. Gradually, we'll arrive at a commonly shared format. This one is not quite there yet. C Update: The app has gone in the reverse direction. One might think, that being next to Silicon Valley and being ground zero for web app development around the world, that the Chronicle app might be a show piece, but that's not the case. Using it can be a brutal experience. Seriously, I am always being asked to resign in on Safari, on Facebook, on Twitter etc... What’s funny is that although the app keeps forgetting that I am a member, they do not forget to charge me the monthly fee which I think is just friggin great. Anyway, the news is top par but if you are expecting to be able to read it whenever you want, it might be easier to just buy an actual newspaper...since The Chronicle can’t ask you to sign into that like a 100 times. I never used this app in the past because I had a much better experience just using the mobile website. In my (print) Sunday paper they were touting the “all new” app so thought I would try it out. While the app experience looks much improved, it would only allow me to see 3 articles even after linking my print subscription. When I click on the prompt for me to sign in, it says that my subscription is already linked. You would think that a company in the center of the tech world could get their **** together. A few suggestions: 1. Don’t present articles as modals. iOS users expect to be able to use the edge swipe gesture to go back to the previous page. You are presenting articles with a cover modal presentation. Your content works best with a navigation controller. 2. Ads popping in make the content shift around a lot. 3. Loading spinners aren’t dismissed when the content finishes loading. The update certainly has potential, and is better than the web views you were using before. But these bugs are really distracting. Finally - a good, working Chronicle app! The previous app froze and crashed so much that I’d stopped using it altogether. The new one is great! Stable, fast performance, nice layout, very easy to use. Great job! I withheld one star due to lack of a search function - a must-have for a newspaper app. Hopefully that can be added before too long. We're here near the Silicon Valley, and these guys can't seem to manage a decent website. Frustrating every day. That was my original review. Happy to amend it today. The new site is magnificent You guys should be proud. It's a great piece of work, worthy of Bruce Jenkins, Willie Brown and Carl Nolte, for sure. Thanks. The latest version is a Big Improvement on prior versions. You must remove and reinstall the app to get the benefits. The paper loads faster, no longer freezes, and is generally very solid. The shipping table is still a mess, but that’s a minor nit. Had such hope for this new version. It loads faster and has less glitches but the price for that is less content?! No horoscopes, no crossword puzzles and no search. Unbelievably disappointing app! Terribly slow to load the app and stories, and crashes constantly. I'm a new subscriber who cancelled his subscription because I could barely use my digital subscription. The paper at the heart of Silicon Valley has what may be the nation’s worst news app. A real shame. The new app is unbearable. Font size can’t be adjusted, huge pictures assault the information seeking reader, and the articles have shrunk to minimal content. It feels like the Chronicle wants to compete with Fox News. Please bring back the old version until you figure this out. Old news is not news! No search, no crosswords. Please give me access to the old app until you fix these issues or I will have cancel my subscription. This latest revision is almost unusable because it freezes *and* crashes almost constantly. It's extremely unfortunate because I have been reading the Chron for well over 50 years and now I'm nearing the point of giving up on it because the app is borderline useless. 12/27/19 Update: Now the new version reloads an article *while you are trying to read it* to get the advertisements loaded. It does this repeatedly, making it difficult to read an/any article. Being on slow satellite internet compounds the obnoxiousness of the problem. Although I deeply enjoy the Chronicle I find myself getting my news elsewhere increasingly frequently due to this incessant, unwelcome “feature” (or bug). No search, no crossword, fewer articles. Not at all happy with this format. I was incredulous when the revision came along and there was no search function. Surely this was a mistake that would be quickly addressed. But noooooo.... Seriously, Chron, we deserve better. Update on prior review (about a month ago): After months of not being able to get through even the first section without the page freezing or closing, I have been able to read the entire paper without problems. Neither updates of the app nor recommendations from tech support were helpful until I posted my last review. Finally, a useful fix. The suggestion was to delete and reload the app. The reloaded app works smoothly and, for the first time since June or July I am getting the news I’ve been paying for. The only remaining glitch is that a few stories about half-way down the “Front Page” are usually cropped at the top so that I don’t see the headline and the top of the photo. Relatively small annoyance that doesn’t really impede my reading. I’m liking the new look. Feels faster, less laggy and a much much better reading experience. More stars if questions answered! I am a long LONG time Chronicle subscriber. Like-my whole life. So I want to post a good review. 1. How to search for an article? 2. Where is the Super Quiz? I have a subscription and I can’t read the e-edition (which has the normal ads in it) without a banner ad across the top from google. Ridiculous. I gave this a one star because I wish to subscribe only through the App Store. I do not wish to setup any account outside of that. And according to you that means it won’t give me full access to the subscription features. I have no intention of sharing any data with you or setting up accounts with you. It should simply work as an App Store purchase in its entirety. The new app is beautiful, but I’ve been unable to log in since its release. I contacted the Chronicle three weeks ago (with multiple follow ups) and they still haven’t resolved this issue. I exclusively read the Chronicle on my iPhone, and now I’m considering canceling my subscription over the lack of support on this issue. I can forgive the bugs, but can’t forgive the lack of customer support on an open issue. Finally good enough to replace energy wasting paper. Pops on a tablet. Another update and renewed frustration. While there are many positives to the new Chron the negatives are glaring. It does not go unnoticed that the developer has not responded to the complaints from others to the misses. Search? Crossword puzzles? Obituaries structure? The worst digital news app I’ve ever used. Just when I thought you were improving this app, today I got yesterday’s headlines & articles under today’s date. When I tried to pull up specific sections or articles, I got blank pages. The app also crashes frequently, sending me back to the New York Times. Being able to read the electronic version of the print paper with the same look and feel was the differentiator worth paying for .... Now, not so much. The new format may not make the cut for reading with a cup of coffee in the morning. The app performance is abysmal ... we rarely get the front page to load and when it does, drilling down to an article often requires closing the app and trying again. Terribly disappointing when Comcast claims 25-100 download speeds Now it wants us to prove we have a subscription to read an article ... this is s is the most expensive and worst performing app we have ... FIX IT!!!!! Seriously, today I had to go back to our paper copy! 2018 ... can’t access Chronicle on any device! Help service is no help! Can’t even reset password! Give me my money back! Format is nice...but where is SEARCH??? [local] SPORTS CALENDAR??? GAMES?? EVEN Dear Abby??? It’s like you opted to shun your local subscribers for a larger audience. If I want global stuff,I read BBC, Reuters, And AP to get global perspective. I want my LOCAL PAPER STUFF. I am disappointed. The new look is refreshing but where can readers find the columnists? Matier & Ross, Willie Brown, and all the others. Please bring back the columnists and the search function! 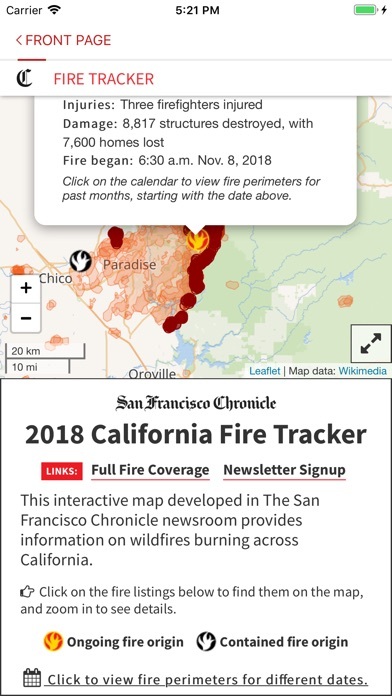 I understand that the Chronicle wants to jump on the fad of large blocks of empty space and pictures that other news apps have recently adopted. I don’t like it but I understand. Why then not allow users to customize by minimizing or eliminating pictures, or adjusting text size? You can’t adjust text size in the app like before, and it also does not appear to respond to the text size adjustment in iOS. I still read a traditional newspaper because I want words. I don’t want pictures, I don’t want white space. Words. Please. So happy to be able to write a positive review of this app finally. The new upgrades make this so much more enjoyable to use. The app is much improved from prior versions. Thank you for that. Why tho is the news presented only a subset of what’s available in the physical paper? It’d seem for paying members, we’d get the same news. Developers, PLEASE read and fix the link to subscription fixture! This app is poorly designed, it consistently reminds me I only have “3 free stories left this month | get access” but I have linked this app to my subscription countless times. It has gotten so irritating that I am tempted to cancel my subscription. The new format is “OK”, but we still are unable to access prior papers and certain stories seem to linger on the Front Page for days. It would be nice to have access to an archive of the prior published papers. On a positive note, the vault is an interesting section, especially the vault photographs. The new app is confusing to navigate. There are constant requests to link the subscription and sometimes to sign in. Reading on the web interface is easier and less buggy. I have given up using the app. Moving my rating to 3 stars. Over last week or so they have more regularly added new content and have reintroduced by lines for lead columnists. Headed in a better direction. From what I can tell the redesigned look and feel of the app (which I like) was accompanied by a significant reduction in the amount of new content loaded each day. The reduction in the amount of new content loaded each day coupled with the removal of several sections/features (featured columnists, games, real estate) has resulted in an app that does not justify the subscription price. I will not be renewing my subscription. You’ve removed content that I’m paying for with this update. Still no horoscopes or crossword puzzles and the obituary section is awful. If I wanted just news, there’s plenty of news available for free online. Please add back horoscopes and other content that you removed. Two features that regularly drew me to the previous app were the Ask Mick LaSalle column, and the horoscopes (especially Sunday’s Minerva feature). The latter might sound silly, but checking the horoscope was a fun daily ritual, followed by reading articles of interest. Now that there is no daily horoscope, I’m out of the habit and ease of visiting the Chron app at all (I’m not going to invest the extra time in looking it up and reading the paper on my laptop at work). Similarly the Ask Mick LaSalle column – if I happened to miss it, very easy to enter it in the search field, and then I’d stick around reading other items – but now it’s inaccessible, unless I happen to visit the app the day it’s published. I’m sure your intent wasn’t to shift daily readers to an occasional rare visit, but at least in my case, that’s the result. Finally an update that has been redesigned - not just more bug squashing. Looks clean and uploads great on my iPad where I read all my news. What’s outrageous is that in doing this the Chronicle has taken away content! We should be getting what is in the print version. Several of the fun things to read that helps me get through all the harsh news is gone. Crossword puzzels, Dear Abby, horoscopes. Even the search function is gone. I contacted the Cronicle and they said to read the .com web page version if I want those things! Backwards thinking. Disappointed. I guess they need us to keep complaining before taking action. The new SF chronicle app is unbelievably worse than the prior app. It is hard to find at a glance which articles I want to look at. Prior app much better. Also there is no search feature? What kind of news app doesn’t have search?? Very bad. And I can’t access horoscopes. Did they forget to put a link? There is perhaps a lack of alignment in terms of how the paper sees itself and how the users see it. I’d rather see this versus many of the articles. Fix it now!! Update 2017: the app has gone through a few iterations. This version was better for about a year. It’s back to crashing, failing to load, etc. worthless! An incredibly buggy app, ads cover pieces of the story, it crashes, etc And now it won't recognize my subscription or let me reset the password. The only reason we kept the limited print subscription was for access to the app. Guess it's time to cancel all ties to the Chronicle. Update 2: The suggestion to delete and reinstall the app fixed the problem. Now the app is a joy to use. I can now focus on the content! Thanks for fixing the problem. Update. I have now installed at least 2 updates since the review below and the daily refresh is not better. It just took 11 MINUTES (not seconds) to see today's edition. First, a blank screen when nothing happens. After 2 minutes I go to another app then return. I try to click on other sections, but nothing happens. Finally I see what looks like the current front page, but it wasn't. Looked like 2 days ago. Finally, I got the new front page. Seriously guys and gals! This is embarrassing for a Silicon Valley app. Especially one that I pay good bucks for. Have you tested this with an ipad mini 4? I am a retired programmer and if I were associated with this, I would be humiliated. ------------------------- I can't believe it takes so long to load. I often just give up. Even after the front page finally loads, clicking on a single link takes a minute or so the first time. 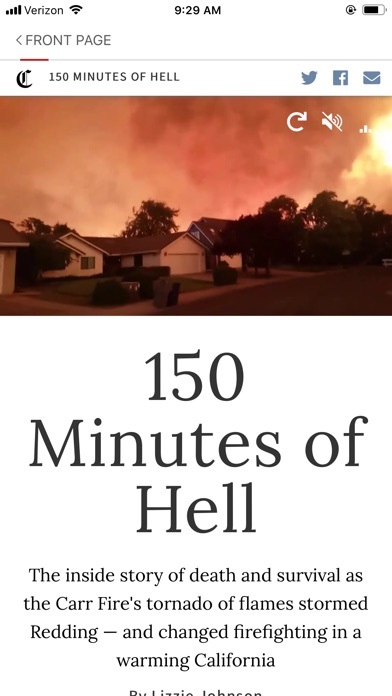 I give two stars which is the average of 0 for speed and 4-5 for content. Update: today it took about 4 minutes just to get the new front page. Then I tried to read an article, and it took me to a blank "waiting" screen over and over. I stopped and went to the main menu or other apps, then tried again. After about a half hour of trying, I finally got to an article. I am using an ipad mini 4 with an up to date OS. Please, please fix. Crashes all the time. Pages freeze. It shuts down. Every time. How do I unsubscribe? Let me know if it ever becomes useable. What if we made it like -- a newspaper? Updated by unloading the reloading from the App store. It does work better now! I cant believe they have such a slow app. The content is good. I want to read the paper. But they just dont seem to give a s**t that its so slow its almost useless. Please...fire your programmers and get someone who cares enough to make it work! (2 years ago)The modified layout is ok, although the old one was better. If they're going to keep old stories around -- i wish they wouldn't -- at least show the date so i don't have to figure out that i already read this yesterday. Better to organize by day, so i can read todays paper, not mix it all up. Of course by far the best electronic newspaper format is ISSUU where we actually get to read the paper exactly like the printed copy. The advertisers should love it too, since we get to see every ad just like in the printed edition. Horrible app - gets worse with every "update." This app is an embarrassment for a newspaper in the heart of the most tech-centric area in the world. It constantly freezes and resets itself - it's hard to make it through one story, let alone more. It took me three tries and 10 minutes just to read one column. Can’t even log in with this new app. Also no crossword puzzle? Likely will cancel subscription. If you can turn off the update so you don’t get this. Thank you so much for refreshing the look of this app! I’m definitely going to be spending more time using it now that scrolling is buttery smooth and the interface is so pleasing to look at! Keep up the great work! I will be cancelling my subscription unless future fixes restore the crossword puzzle. This app is so bad. It won’t recognize my subscription and not only is there no crossword, there is no search function!!!! When I called and told them about the search function, the reply was “we are always trying to improve our functionality”. What load of nonsense! I don’t have any problems with the NYT app. I’m done with the SFChron. Total waste of money. Version 3 - Finally!!! Now it seems like a professionally created app. More to come as I use this much improved version. Version 2.3.10 - more reliable now. Fixed music problem. Not a fan of the interface feel but it is working. Continue my wish for larger fonts like almost ALL other news apps. Version 2.3.8 - still crashes daily. If you are listening to music while reading your paper, it will repeatedly stop your music from playing. Navigation with the swipe left and right makes scrolling through an article challenging. Still wish for a larger font. Version 2.2.5 - really pretty much the same. I have written to the support team and they say they are working in it. But this app has really not improved much in the past year. Layout and image placement has improved. But load times and crashes have not. And the app is often unresponsive when you return to it from another app. This app is still inconsistent and crashes daily. While there is some control over font size - still too small for my eyes. The layout is inconsistent and images sometimes do not show up. It seems their support team is as frustrated with their developers as the users are. I truly want to support the chronicle with my subscription but the app really has to work better. Previous - This is how I get my Chronicle every day. The articles are all there and they have fixed many interface issues. But they also introduced a new one - if you get an error due to spotty Internet coverage, the only recourse is to relaunch the app, even when there is Internet access. 1. Slow and annoying reloads when switching apps. If you leave the app and come back, you will get back to where you left off, but only after a tedious reload. FIXED 2. Also slow to switch between articles and even turn pages. The page turn slides the entire interface across the screen just to get to the next page. Most apps I used for reading are much faster than this one. IMPROVED 3. Part of the reason I read the paper digitally is to be able to follow links in articles. Most links are just listed as text so you cannot click on them. Nor can you even copy the text to put in a browser. Major flaw! IMPROVED 4. Seems to take forever to download a new edition (on very fast wifi). Often get message to quit the app as new edition has just been downloaded - annoying. And don't even try to download to read offline. Takes forever. FIXED - but they still have a poor updating process. Where is search and games? New app has a faster response but eliminating search function and games is a reduction of usability. Please bring these back! Where are the columnists and search function? Wanhhhh! The new app is pretty but so few stories, no search function and how am I going to find Willie and Heather? HELP! Terrible interface. Takes forever to load pages and stories. Links and downloadables don't work. Yet, I pay my bill each month. STRIKE THAT, CANCELLED AND DELETED. You updated the app today and you have still not brought back horoscopes. And no crossword puzzles either. And the obituary section is awful. This app needs a lot more work. I’m very disappointed at the developer of this app. I’m paying for this subscription and I expect the app to get better over time. It’s not. It’s far worse and it wasn’t good to start with! Not only does it take longer to download anything - no crossword puzzles. Seriously considering ending my subscription- plenty of free news sites to get news. Thanks for trying to improve, however you TOTALLY screwed up the obituary section. It isn’t the daily posts as in the past, it’s a list of over 60 names to scroll through that have already been published. Why don’t you configure this section like what’s in your print copy? Cannot find the Sudoku or Crosswords. I did the crosswords every day. They seem to be missing from the updated app. That was the main use for me for this app since I get the print version of the paper. Really. No option to adjust the font size? How about doing away with the silly light gray text. It is impossible to read when the text is soooooo small. Hard to believe living in the global tech capital that I have to explain these common and appreciated features. In a rural area where we depend upon a satellite service, the Chronicle app is almost useless. Many freezes, often when you click on a link it’s all over, requiring a double click to reboot the app. This is a three year old ipad. The NYT app works fine here; maybe the Chron should lease their technology. Version 2.3.10 - more reliable now. Fixed music problem. Not a fan of the interface feel but it is working. Continue my wish for larger fonts like almost ALL other news apps. Version 2.3.8 - still crashes daily. If you are listening to music while reading your paper, it will repeatedly stop your music from playing. Navigation with the swipe left and right makes scrolling through an article challenging. Still wish for a larger font. Version 2.2.5 - really pretty much the same. I have written to the support team and they say they are working in it. But this app has really not improved much in the past year. Layout and image placement has improved. But load times and crashes have not. And the app is often unresponsive when you return to it from another app. This app is still inconsistent and crashes daily. While there is some control over font size - still too small for my eyes. The layout is inconsistent and images sometimes do not show up. It seems their support team is as frustrated with their developers as the users are. I truly want to support the chronicle with my subscription but the app really has to work better. Previous - This is how I get my Chronicle every day. The articles are all there and they have fixed many interface issues. But they also introduced a new one - if you get an error due to spotty Internet coverage, the only recourse is to relaunch the app, even when there is Internet access. 1. Slow and annoying reloads when switching apps. If you leave the app and come back, you will get back to where you left off, but only after a tedious reload. FIXED 2. Also slow to switch between articles and even turn pages. The page turn slides the entire interface across the screen just to get to the next page. Most apps I used for reading are much faster than this one. IMPROVED 3. Part of the reason I read the paper digitally is to be able to follow links in articles. Most links are just listed as text so you cannot click on them. Nor can you even copy the text to put in a browser. Major flaw! IMPROVED 4. Seems to take forever to download a new edition (on very fast wifi). Often get message to quit the app as new edition has just been downloaded - annoying. And don't even try to download to read offline. Takes forever. FIXED - but they still have a poor updating process. Previous problems with very slow or no loading, or loading yesterdays paper, have been fixed. App now loads quickly and responds promptly to switches between sections or loading an article from a particular section. In other words, it now acts like a newspaper app should. System locks you into the paygate—after they take your money. Avoid this app until the SF Chronicle can find some developers who can make the system work for subscribers. Used the new app for the first time and underwhelmed. Visual layout is fine but the news displayed is OLD. The front page did not have a single article that wasn’t from Sunday’s version. Thinking this was just the front page I went to sports and only found one new. The sports calendar displayed was from the past weekend. Give us back the old version. Not worth the price if all I get is old news. And I thought the old app was bad! This app recognizes my print subscription but still won't let me read the articles. What a waste of time. Have reset my account. Online I am fine , but the iPad app tells meI do not have a subscription. Once again the chronicle is clueless about doing any testing when they make changes. This is after I was unable to access the app for two weeks while traveling. Post and NYT apps worked without issues. I’m new to this app so maybe it is my inexperience but the UI doesn’t seem intuitive. I also have trouble finding news that interests me. Liked the old one a little better for news, but I’m missing the games! I got used to playing the games every night. Will you be bringing them back? Thanks for the update. BUT no horoscopes and no crossword puzzles. Where are these hidden in this app update? Or am I paying for something that you have removed? Words cannot describe how poorly this ap works. Constant freezes essentially make reading the Chronicle impossible. I have been trying to read just one section and have wasted 30 minutes. When will the Chronicle address the problem? Deleted the App & reinstalled as directed. Much improved, thank you! Able to enjoy Chronicle again. What happen to the search feature on the latest update? I have the actual Chronicle delivered to my house. The only thing I use the app for is to do the crossword puzzles. And you apparently decided we don’t need them. Moving up to a two star. The app was almost unusable with 20 minute or more load times for the morning paper. I gave it a 1 star because there was no zero. The App developer contacted me and suggested I delete and reinstall which had no effect. A new iPad did the trick. Not a big jump in iPad but night and day difference in the app. If the app runs well for a while I’ll bump up my rating again. Wow. I didn’t the think the chron had it in them to make a good app. For the last few years I’ve regularly rated the SF Chron as 1 star. The latest update is huge and very welcomed. You can debate the style and I’m sure there will be tweaks. But so far, this app is useable! That only would be a major improvement in itself but the design is modern too. The new version is an improvement on layout but Search has disappeared and can’t find items like crosswords and horoscopes. Needs a fix. After giving this app a 1 star rating, I was contacted by the developer’s customer support who advised me to delete and reinstall the app to address my performance problems. I’m happy to report that this did fix the problem and the app has returned to a quite usable state. If you are also having performance problems that are not network related, I suggest trying this. Hats off to the developer for taking the initiative to contact me with a suggested fix. I did the latest update and the app no longer works. It says “invalid server response”. I deleted and reinstalled it. The problem remains. App is on a 10.5 inch iPad Pro. The new version is much faster and responsive on my iPhone 6s+ than the old version. The layout and font are elegant and clean. Thanks for the great works! The performance of the latest version is great. I previously had problems with slow content load times. Technical support had me delete and reinstall the App and it fixed the problem. I’m very happy with the performance and content. Unusable when I first tried it, now getting better. New app looks pretty, but I can link to my print subscription. Not very useful! V3 looks good, but no crossword? Had sign-in problems when “upgrading” from V2 to V3, but deleting and reinstalling the app seems to have fixed it. Previous versions however had crossword puzzles and the latest version does not, or at least I can’t find them. Bummer! Just “upgraded” to the latest version of the app on my iPad. Now it looks nicer but I can’t log in, so it’s basically useless. It still works in the old version on my iPhone, so I can read it there, but I’m not about to do the update on my phone until the login problem is fixed. Worst app I’ve experienced. Most of the time it won’t load anything but the Front Page and Comics sections—if those. It freezes before I can get through the Front Page section. Last week Tuesday’s Front Page stayed through the rest of the week; only the date changed. I’ve attempted to get tech help, but their suggestions have not fixed the problems. Some days I’ve managed to get through a few extra sections, but only by closing and removing the app, and hard booting the iPad several times. I moved from Bay Area to Texas. 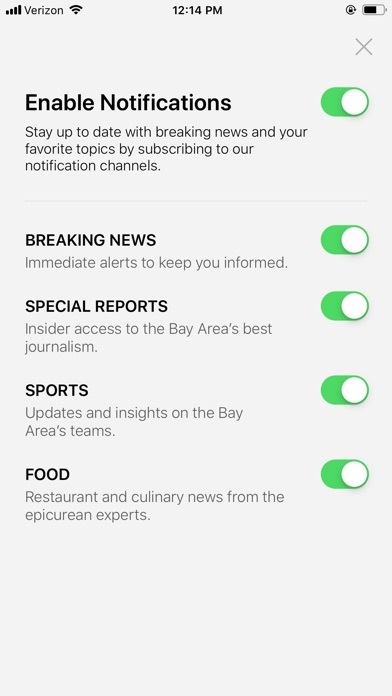 Got app to keep up with Bay Area sports. Many times articles stay the same in all sections for up to a week and sometimes even more. Poor attempt to digitize a paper. The real paper I used to get daily was great! The key to happiness with this app is to open it two minutes before you want to use it. By then it will be ready. And be patient while it unfreezes. I love the way the app emulates the look of the newspaper and I use it daily. However, in the past few months the app functionality has devolved. I cannot forward articles without the attempt to do so causing the app to crash. Also, the headlines of articles I had read used to turn from black to grey, no longer do they do so. I would imagine a growing number of subscribers read the Chronicle via a tablet. I WISH THEY WOULD FIX THE BUGS PROMPTLY! This app is ridiculously buggy and the Chron does nothing to insure these bugs are addressed when they are brought to their attention. Therefore, you cannot rely on the app to allow you to read the paper for which you pay. Well, the improvement didn't last. My previous problem is now gone. Now I find that animbedded video is sensitive. 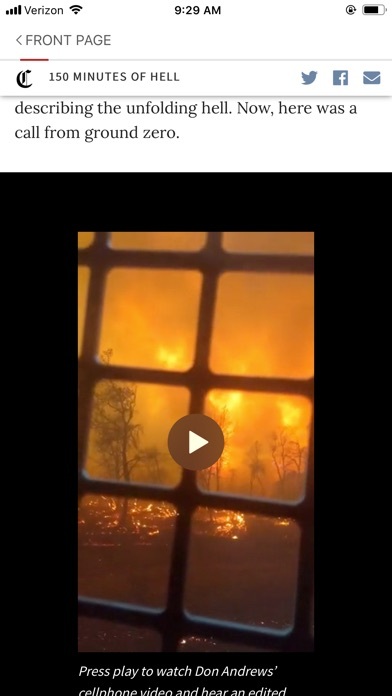 The video starts to run when I am trying to scroll down. I can't touch the video without the video starting up. Usually I try to flick it to scroll. But the video starts instead. Too sensitive. -------------- Now it is much much slower in loading the articles. It doesn't matter if I use my cellular connection or my home wifi. It can crash sometimes when trying to download an article. Sometimes it will crash and close upon trying to start it. 07/24. It has been a few weeks and yet nothing has been done about the problems. Users should be given credit or time added to the subscription for such poor performance. I may end up canceling my subscription if this type performance keeps up. 08/01: Finally they have fix the issues of crashing, slow starting and loading. I hope they improve the articles. There are some old articles hanging it there. 08/02: Slow loading is back. I wonder if their server is slow. At least it hasn't crashed yet. Why are other news app so much quicker. They also have photos to load. 08/07: It has crashed a couple of times when trying to start the app. Who ever is doing the programming for this app should be taken out to the woodshed. 08/09: I wonder what goes on overnight. Now this app is worst this morning. Now it freezes for a longer period of time. Several minutes. It has crashed twice. When I use other news that have pictures to download they work fine. 08/20: Inconsistent performance. Sometimes it might load articles fairly quickly. Certainly not as quick as other news apps. It can still crash. As others have noted. When trying to load an article it seems like nothing is happening for a couple of minutes. 10/16: For a while the app was quicker in downloading the news. But it seems to fallen back again to a slow start and download. Even has crashed a few times. I wonder what makes this such a low performing news app. Other apps have photos also. 11/11/17: I downloaded and reinstalled this app after deleting it. Now it is finally working the way it should have. It finally has some snap to it. I will have see if it will last. It’s seems like they worked through bugs and now the Chronicle apps works much better. Straight forward and easy navigation. After YEARS of dealing with one of the worst apps ever, horrible update after horrible update, I must tip my hat to this version of a functional app. Loads quickly, hasn't crashed (so far) and relatively easy to use. Thank you! This app is very buggy on the new iPad Pro (3rd generation). It continually asked to log in and then won’t accept the password, yet it shows I have an active digital subscription. I hope it can be fixed to support the new iPads. I have been a subscriber to the SF Chron for 40 years, first as a paper subscriber, lately as a iPad subscriber. First the app: AWFUL! I also subscribe to the NYT, Wash Post and the Guardian. These apps refresh immediately, the Chron is very very slow. I have actually given up while trying to refresh to today's news. Ironic that they are so close to the Silicon Valley yet have so poor an app. As to the newspaper, the quality has declined dramatically over the years. One reason I subscribe is for sports coverage . It is scant, I turn to other sources. Addendum, November 10,2012: after prompting by Apple the Chron, I deleted, then reinstalled the app. It now seems to work normally, that is articles now open up in a timely manner, and I haven’t had to exit the app after giving up. This app seems to get worse with each release. It is constantly freezing and very slow when it eventually runs. Apple should bar this app from the App Store. It just keeps getting worse. Now it takes over 10 minutes to load. A tragedy - I reinstalled the app a couple of times and I often clear data. I reset my iPad and reinstalled a couple of weeks ago and the crashing hasn’t been bad. It still can be sluggish in the navigation but you can at least read sections of the paper while it works out the updating. Terrible Apps - still bad bad and very bad. Getting worst. No Star. Worst user experience ever. You pay for the service and expect timely news. No. The performance is getting worst. You have to wait 15-20 mins for the download, and while waiting, it sometime freeze your screen. The apps doesn't tell your what is going on. This is not the SF Chronicle paper standard that I grow and love the past 25 years. Nothing worst than sitting down with your coffee very morning, ready to read today's news, and find out that the apps is still loading. After you finish the coffee, the apps is still loading. You start reading news via Google news or Yahoo, and after you finish reading all the headlines, the apps is still loading. TERRIBLE! Don't get this a App until they fix it. This app is a joke; unfortunately not a funny one. IF you can read 1 article then the app will freeze. Cannot 'go back' or forward or anything. Absolutely ridiculous for a world class city to have such a horrible excuse for a paper. It better now than at it recent low point (see last paragraph)which it was like an object falling into a “black hole”. This version seems to work reliably well enough that I gone back to reading the Chronicle for local news. Who knows what the future holds? You can read my original rating below. The current version of the app works well, and has good functionality. Compared to the earlier versions it’s much, much better. In some ways I like it better than The NY Times app, which seems to have been driven towards mediocrity by over ambition and advertising screen real estate. It has been a long haul for the chronicle hopefully the recent progress continues. My original assessment continues: The overall reading format is still clunky, but the apps reliability and usefulness has improved, ie. it doesn't crash as much. The NY Times continues to perform consistently better. Gradually, we'll arrive at a commonly shared format. This one is not quite there yet. C Update: The app has gone in the reverse direction. One might think, that being next to Silicon Valley and being ground zero for web app development around the world, that the Chronicle app might be a show piece, but that's not the case. Using it can be a brutal experience. I have had absolutely zero problems with this app. It is extremely user friendly and I actually like being told “It’s a new day” as it refreshes with the current newspaper. I have not tried to go into the archives, so can’t give a complete review, but I’m impressed. Loads extremely slow. Frequent crashes. The Chronicle should be embarrassed. Please fix this terrible app. I also have the NYT and WAPO apps. They are far superior. Easier to read and no problems loading and freezing. This is a poor attempt to digitize a newspaper, it doesn’t load, can’t read offline and it crashes a lot on me. I open it up to blank white screen with zero content. I have to close it and reopen it multiple times to get it to load. Amazing since they have had years to fix this. Almost not worth subscribing to. I cant believe they have such a slow app. The content is good. I want to read the paper. But they just dont seem to give a s**t that its so slow its almost useless. Please...fire your programmers and get someone who cares enough to make it work! (2 years ago)The modified layout is ok, although the old one was better. If they're going to keep old stories around -- i wish they wouldn't -- at least show the date so i don't have to figure out that i already read this yesterday. Better to organize by day, so i can read todays paper, not mix it all up. Of course by far the best electronic newspaper format is ISSUU where we actually get to read the paper exactly like the printed copy. The advertisers should love it too, since we get to see every ad just like in the printed edition. This software constantly freezes my iphone, so I have to go out of the paper and then hope it unfreezes when I go back in. Their last software was great. I never finish reading the paper, it is too frustrating. This app should be removed from the App Store. It is that bad. Constant, reproducible, hangs and crashes, and slow performance. It has always been this way and has never gotten any better in any of their updates. If I were responsible for developing and releasing this application I’d be ashamed. Any person or company involved in the development of this application should find another profession. This is not an improvement! I Really, Really wanted to subscribe to the on-line Chron, but they apparently Really, Really don’t want me to. Screen freezes, multi-minute waits for the next page to load, and stories that are weeks old intermixed with current news is intolerable. I cancelled once and then resubscribed, but this time I’m gone, never to return. This app has always taken too long to load, not only at first but each and every article. Now it has started to crash every 2-3 minutes so I get to wait for loads even more frequently. This deserves zero stars! Why do I bother? The layout and content are quite good. If there was any other way to get the Chron online I would not use this app. The app won't boot up half the time. Why can't the Chronicle get it right??? The key to happiness with this app is to open it two minutes before you want to use it. By then it will be ready. You would think a paper coming from SF has potential to have the best resources for a successful app. Wrong. Someone needs to call the group responsible for the Santa Cruz Sentinel. Simple & always works. Horrible business model, can’t cancel subscription, SF Chronicle and Apple iTunes cannot help you. No cross platform support for other devices. Only shows a fraction of the available print stories. Run. Don’t. Walk. Away. The Chron app is still unpredictable and is often very difficult, if not impossible to manage. At least there is now a search function. My comments are based on using different Apple products, all up to date. It often freezes and crashes, in spite of some improvements. The ipad app is a disaster. The worst I have ever encountered. No wonder the Chronicle is failing. Possibly the most buggy news app from a major news source on the App Store. Absolutely terrible. I want to support the Chronicle and read good local (although mainstream) SF journalism, but the app is SO bad. How can a newspaper that is located near the center of the tech universe have such a bad app??!?? The old version was so good. How in the world can you update to such a poor version? The App won't open to new day news even when I quit and try again. I can't read it anymore. Please go back!!!! How long can it take to fix this? It’s been weeks and no update. How long can it take to fix. Refund people. Over and over again, I will tap on an article and the page comes up blank. The wheel in the center just sits there and spins, while doing nothing. Other articles will pop right up. I don't understand how one can pop up but another won't. I've sent this before and was told it would be corrected. That was months ago. I'm paying $5.99 a month for literally nothing! When are they going to fix this app? It is an absolute mess! See title. You need to fix it. Now the does not crash daily! Overall, I think this app is pretty good, but the password management is horrible. I’m currently locked out of the app even though my subscription including digital is active. Have tried resetting password. No luck. I’ve had this problem repeatedly. If you want people to stop using your app, asking them to continually enter passwords is a sure fire way to do it. The update fixed many of the issues I was having with this app. Downloading of the new issue is fast as is loading of articles. Crossword playability is very good. Same things that others have said. Crashes, freezing and won't update. I won't be renewing if this isn't fixed. Breathtaking how long it takes to download an article! And crash periodically! Just horrible. The app is really bug laden--lots of crashes, won't load except after a full reboot, miscellaneous halts. However, I'd rather read the Chronicle this way so I'll deal. The new version of the crosswords REALLY doesn't work well: very hard to read and usually won't load. I was born and raised in the SF Bay Area and now live where I cannot get a hard copy...so I LOVE GETTING MY E-Edition! I’d rather be living close to home, but thank you for my E-Edition! I am very disappointed with this app. It is slow to load new data. Very poorly coded app This app is a mess. It is impossible to read articles as the pages never load. I will be cancelling the subscription not worth the agony. On my new iPad, this app doesn't open except after several attempts, then when it does open, it shortly freezes up and I have to start all over again trying to open it... SAD - I also read the LA Times and the Mendocino Beacon on my iPad without any problems. I guess there aren't any tech people in SF. Not only do they make it really difficult to sign in even as a paid subscriber, I was able to bypass my lock screen by opening a story from the notifications. This app has been going downhill since the more positive review I posted a year or two ago. Granted it’s generally faster and crashes less now. But various bad design decisions and bad content curation have made it so difficult to use that I now frequently find it necessary to leave the app and instead go to the Chronicle’s facsimile edition in Safari. This is particularly true for the Datebook section and for other articles that while headlined in other sections seem to be retrieved from Datebook. They come up excruciatingly slowly and seem not to be readable at all from other countries while travelling. And periodically whole blocks of content disappear like some columns or most of the comics for the past week. To your answer: No, it is not an updating the app problem. Missing content is a curation problem, and eventually someone notices and fixes it, like the comics came back today after going missing over the weekend. The speed and accessibility-from-Europe issues have been with us for months and are a fundamental design problem dating from when someone decided to replace A&E with Datebook wrapped from sfchronicle.com or something of that sort. There’s a real problem with this app right now. When I select many articles they open but the app also displays a “Content Unavailable - Sorry we could not find the specified content“ message that must be dismissed. When I try to open other content I receive a message that it can’t be displayed because I don’t have an internet connection...yet I do. Also, every time I open certain content I receive annoying demand windows to subscribe even though I’m already a subscriber. Then there’s this: Over the past few days most of the comics have disappeared and today there are none. Finally, do we really have so little news that much of the front page is dedicated to sports? That’s what the Sports section is for. I’ve subscribed to the Chronicle for years, first in print and now via the app...and the app, over all its iterations, continues to disappoint. This app has been going downhill since the more positive review I posted a year or two ago. Granted it’s generally faster and crashes less now. But various bad design decisions and bad content curation have made it so difficult to use that I now frequently find it necessary to leave the app and instead go to the Chronicle’s facsimile edition in Safari. This is particularly true for the Datebook section and for other articles that while headlined in other sections seem to be retrieved from Datebook. They come up excruciatingly slowly and seem not to be readable at all from other countries while travelling. And periodically whole blocks of content disappear like some columns or most of the comics for the past week. Yes I am using literally literally. The quality of this app is so poor as to be unusable. The majority of the time, the front page is nothing but a white screen. any attempt to respond to news alerts in the notification Center crashes the app. At this point I have simply given up. My previous problem is now gone. Now I find that animbedded video is sensitive. The video starts to run when I am trying to scroll down. I can't touch the video without the video starting up. Usually I try to flick it to scroll. But the video starts instead. Too sensitive. -------------- Now it is much much slower in loading the articles. It doesn't matter if I use my cellular connection or my home wifi. It can crash sometimes when trying to download an article. Sometimes it will crash and close upon trying to start it. 07/24. It has been a few weeks and yet nothing has been done about the problems. Users should be given credit or time added to the subscription for such poor performance. I may end up canceling my subscription if this type performance keeps up. 08/01: Finally they have fix the issues of crashing, slow starting and loading. I hope they improve the articles. There are some old articles hanging it there. 08/02: Slow loading is back. I wonder if their server is slow. At least it hasn't crashed yet. Why are other news app so much quicker. They also have photos to load. 08/07: It has crashed a couple of times when trying to start the app. Who ever is doing the programming for this app should be taken out to the woodshed. 08/09: I wonder what goes on overnight. Now this app is worst this morning. Now it freezes for a longer period of time. Several minutes. It has crashed twice. When I use other news that have pictures to download they work fine. 08/20: Inconsistent performance. Sometimes it might load articles fairly quickly. Certainly not as quick as other news apps. It can still crash. As others have noted. When trying to load an article it seems like nothing is happening for a couple of minutes. 10/16: For a while the app was quicker in downloading the news. But it seems to fallen back again to a slow start and download. Even has crashed a few times. I wonder what makes this such a low performing news app. Other apps have photos also. Can’t you find better programmers in SF? Absolutely worst news app ever. Slow slow slow load time, unresponsive behavior, constant crashing. It has gotten worse over time. I subscribe to a number of newspapers online- NYT, Washington Post and the Chronicle. But I never get to read the Chronicle because it takes forever to load and crashes (or freezes) whenever I try to browse. Very frustrating and I don’t understand why their app doesn’t perform like other large newspapers. Really disgraceful. As indicated by others, the app is currently all but unusable. Embarrassing effort! This has got to be the worst app ever. Takes forever to upload. Won't switch to different sections. Gets stuck when you try to scroll. I couldn't be more disappointed with the Chron app. It is entirely unstable, doesn't load from alerts and doesn't update. The phrase "utterly useless" comes to mind. Not helpful during this especially stressful time in the Bay Area where people are relying on news more than ever. What happened to the Comics?! All that’s left are Bizarro, Mutts, Sherman’s Lagoon, and Zits. While I like these, all the rest have disappeared. When the regular news is constantly depressing, at least I have the Comics to look forward to, but apparently someone has decided to make a huge cutback. This app is not that great anyway, but this puts it below the bottom. You'd think a San Francisco paper could find someone who could make functional app, but the Chronicle can't seem to. Doesn't open. If it opens it won't load. If it loads it won't refresh. If you get that far you're confronted with both app and subscription password issues that don't seem to stick. If you're a subscriber, just read (if you must) via a browser. What an awful newspaper app. There is a fix though. It stores large amounts of data and that slows to stops the app when the storage gets big. Go to setting and clear storage and set it not to save data. You can also erase and reload the app. Once I did this it actually worked fairly fast. This continues to be a truly terrible app. I am a lifelong Chronicle reader, but this app makes it nearly impossible to consume their product. Loads glacially, crashes repeatedly. The Chron is doing its best to drive me away as a customer. I’m actually surprised this app is allowed in the Apple App Store. It consistently crashes and freezes, and it almost feels like it is getting worst over the past few months. Words cannot describe how poorly this ap works. Constant freezes essentially make reading the Chronicle impossible. I have been trying to read just one section and have wasted 30 minutes. When will the Chronicle address the problem? What good is an app that doesn’t load? The update says they fixed the load time? What a joke! The Chronicle irrelevant if you can’t read it. UPDATE 10/13/17: hard as it is to believe, this POS app has gotten WORSE. Everything noted in my earlier review still problematic, but now even worse. It’s astoundingly terrible and Hearst clearly doesn’t care. Much as I love the writing staff, I may have to give up and cancel; the daily aggravation just isn’t worth it. Old review: Horrible, just horrible. Crashes constantly, doesn't launch half the time, shockingly awful UI....I just can't believe anyone would look at this app and decide to ship it to users. If I didn't want to read this particular group of writers, I'd never use it. As it is, I'm now seriously considering going back to the print version or only reading SF Gate. After months of repeated attempts to use this app, I have finally given up. It used to consistently show stale and cached articles (while updating the time stamp). Now the front page doesn't load at all - whether on wifi or LTE. Chronicle, please apply some basic development resources to the app to make it even a tiny bit useful. I have reset the app from preferences and I have even rebooted my iPad 3, but this app refuses to progress further than initial title screen without crashing. This behavior has even followed between iPads. It worked intermittently on my old iPad 1, long enough for me to subscribe. After one of the updates, it never ran again, on old or new hardware. Now I need to go cancel my subscription. Update: Five years later this app is still a mess and mostly unusable. If I’m lucky enough for it to allow me to read an article, it freezes and becomes unresponsive when I try to switch to another. Why is this so hard to get right? Articles are good, interesting. But, some times cannot change sections...must close then start over. Also, some sections do not open. The writing staff for the chronicle itself is great! The have a great set of columnist like Ann Killion, Carl Nolte and Willie Brown. They are good enough that I put up with the clunky app. Note the app became slow but I deleted it and reloaded and it works great now. The older version was slow but reflected what you expected from a newspaper...todays news. The current version is faster and graphically nicer but it's not a newspaper app. You can't sort the articles to read todays news. Its a hodgepodge of articles from whenever they decided that are made to look like a news app. The Front Page has a lead article from Halloween 2015 as I'm reading it on 03 January 2016. The whole "issue" is composed of old and new articles that repeat day after day. Glad I still get the physical Chronicle newspaper. I'm not using the app again. Off to read the NY times on my ipad now. This most recent version (from late 2017) seems to be a big improvement. However, I had to delete the older version and re-install the latest version to achieve the stability that the new version offers. There still are some problems with rendering images when more than 10 are included with a story. Frequently see blank/black spaces where an image(s) should be seen. Overall- it’s gotten quite a bit better. Update: Ok, the issue of "hanging on opening" has been resolved with the recent upgrade. However, the app continues to act wonky on the iPad. Note: I have a brand new iPad so this is not a hardware problem. Sometimes when I open the app, it defaults to the last section of the paper (e.g. Sports; Business; etc) and it won't let me go back to the Front Page. I have to close it and re-open. Other times, the navigation menu on the upper left corner of the screen is not present. Again, I have to close and re-open. While the app is better, it clearly doesn't compare to The NY Times iPad app. --------------------------------------------------------- I can't really upgrade the review below. This app still hangs when opening the first article each time I open it. I still have to close the app (eg throw it off the screen) and re-open it for the first article be open. This app is still not as good as the NY Times mobile app. As an update to my previous review (below) the app still almost always freezes on first opening. Requires that I throw the app off the screen (at least once) and then re-open in order to get the first story to actually load. Frustrating that this app still continues to be problematic compared to the NY Times app. The Chron iPad app is still not as fast as the NY Times version in terms of page loading. This current version is better but there a still problems with freezing-up after opening. I still have to close the app; throw it off the screen and re-start to get the first story to actually render on the screen. However, compared to my original review (below) it's definitely an improvement. This app has a number of on-going problems that have yet to be resolved. Pages still don't render correctly on pages with banner ads at the bottom of the page. This requires that the user reset the font size so that text re-renders correctly. Otherwise text appears underneath the banner ad! This is just poor programming. In addition, the app still crashes (although not as often as before.) This app should be as good as the NY Times mobile app - but it isn't. The NorCal brewery map story has been on the front page for over a year. And that’s only the beginning of this apps problems Also, I rated the app literally yesterday and now it’s interrupting my reading to nag me to rate the app? The SF Chronicle app is much slower that the NYT and Washington Post apps for iphone. It takes a long time to load and moving around is very slow. The screen freezes sometimes as well. Please fix. Content is great and getting better every day. There is a lot of journalistic talent at the Chron! I use this app five or six days a week to read the Chronicle on the ferry. Generally it works well, and navigation works extremely well in the most recent versions of the app. The only real flaw is that the “download for off-line reading” fails from time to time. The consequence is that when the Internet is unavailable while the ferry is in the middle of the bay, the app sometimes says “content unavailable” even for the text. Clicking the red “Download” bar twice while the Internet connection is still available seems to make it worse. But overall it is quite a good app for reading the newspaper. The only other thing I would criticize is that it has no button that allows one to see exactly which stories are in the printed version of the day’s Chronicle, which people sometimes refer to in discussions with me. The online version contains stories that are older, but also not all the new stories that are in the printed version of the paper, as far as I can tell. Th San Francisco Chronicle app is the worst app newspaper app available. It is slow, prone to freezing, and graphically poorly designed. Two major problems: first, there is no search function (or at least it's not easily found). Second, the front page and subsequent pages/sections are populated by old articles. Nothing like opening the Local News section on January 2 to find out about public transportation options for New Years Eve - an article that ran two days prior and is now totally irrelevant. I read the newspaper to find out about NEWS (that's why it's not called an oldspaper). C'mon Chronicle...if you're committed to delivering online news, prove it. If you're not committed, then stop publishing an online edition. I HAVE REPEATEDLY WRITTEN TO THE CHRONICLE ABOUT ALL OF THE SECTIONS THAT ARE STILL MISSING FROM THE PAPER SINCE THE UPGRADE WITH ZERO INDICATION OF WHEN IF EVER THEY WILL FIX. AFTER DECADES OF ENJOYMENT, AM NEARING A TURNING POINT WHERE THE PROPER RESPONSE IS TO CANCEL MY SUBSCRIPTION. Another update and renewed frustration. While there are many positives to the new Chron the negatives are glaring. It does not go unnoticed that the developer has not responded to the complaints from others to the misses. Search? Crossword puzzles? Obituaries structure? I have written directly to the Chronicle as a print subscriber about the problem others have identified: it will not recognize a subscriber and requires you to go back over and over to link your print subscription, even between articles. Enough already! Fix this app! Your update didn’t solve this problem! There is very little fresh content in the digital edition. The majority of news articles that are published each new day in the digital edition are rehashed dated stories that sometimes are as dated as 5 days old. Most are dated between 2 to 3 days old. For example, for today’s edition of 12/31/2018, many stories were from the digital edition for 12/29/2018. There are some that are some articles that are dated 12/31/2018, however, my guess is that they compromise about less than 10 percent of the articles in the news paper. I’ve noticed that the reporters that carry the heaviest load, other than Sports, are few and mainly young. I guessing that these reporters are “cutting their teeth” as reporters while working with the Chronicle until they gain enough experience to move on to bigger and better newspapers. One final problem, since the reformatted update was rolled out last month, there is no way to adjust the size of the font. Is there a search function?? ?